The Huronia Stallions Varsity team overcame a late 24-14 fourth quarter deficit to defeat the Oshawa Hawkeyes 27-24. The Stallions have secured the fourth seed in the Ontario Football Conference’s Eastern Division and have excellent playoff prospects. The game looked dire for Huronia when Oshawa blocked a punt for a touchdown to take a ten-point lead with just over four minutes remaining. Issachar Sookwah then flipped the script by taking the ensuing kickoff 96-yards for a touchdown. Sookwah who already had scored two rushing touchdowns on the day then hammered the Oshawa kick returner forcing a fumble that the Stallions recovered. Sookwah then scored his fourth touchdown on the day on a screen pass to complete one of the greatest individual performances in Stallions history. 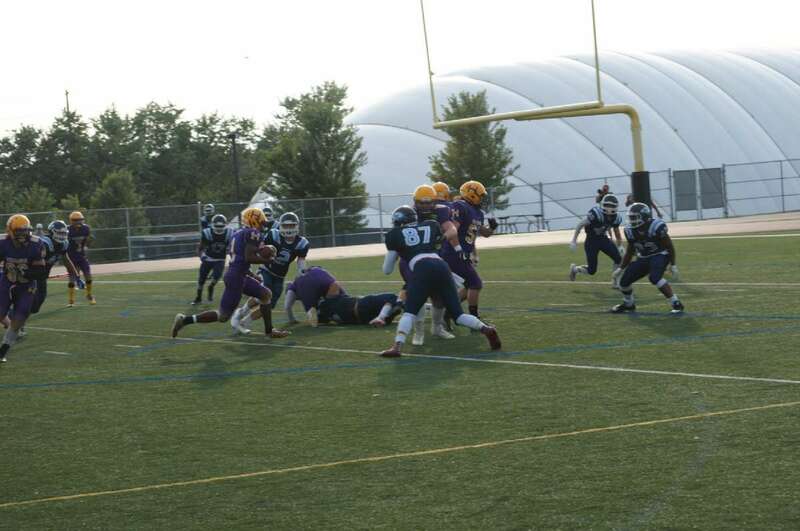 The Stallions were led on defence by the stout run defence of Middle Linebacker Charles Doering who also had a key fourth-quarter blocked punt. Kayden Peters and Jordan Travis both had big plays with interceptions. The 5-2-1 Stallions advance to take on the 7-0-1 Scarborough Thunder in the OFC Quarterfinals this Saturday at 2:30 pm at Birchmount Stadium. The two teams played to a 13-13 tie two weeks ago so the game expects to be a close contest. The Huronia Stallions Junior Varsity team lost a hard-fought 53-23 decision to the Oshawa Hawkeyes. The Stallions came out of the gate roaring with key plays on offence, defence, and special teams to take an early 21-3 lead. The Stallions offence seized the momentum with an early touchdown drive, forced a turnover on defence that lead to another touchdown, and then stunned Oshawa by recovering an onside kick and scoring on a 52-yard touchdown pass on a trick play where receiver Brayden Harkness completed a long touchdown pass to Mark Arrizza. Oshawa then reversed the momentum in the second quarter to take a 24-21 lead at halftime. The Stallions kept the game close until the fourth quarter when they began substituting in inexperienced players. Oshawa showed questionable sportsmanship by keeping their starters in the full game and throwing touchdown passes in the final minutes of the contest to make the score more lopsided than the game action reflected. The Stallions were led on offence by the sensational play of Running Back Rio Campo. Campo got his first ever start on offence and rushed for over 150 yards and a touchdown in a scintillating performance. Fullback Ryan Rogers scored the other Stallions touchdown to cap off a season of fine play. Victor Garcia and Scott Laybolt were the top Stallions defenders on the day. The Stallions finish the season with a 2-6 record but showed continual growth and improvement throughout the year. The team is very young with most players eligible to play at the Junior Varsity level in 2019. The Huronia Stallions Bantam team lost a 28-0 decision to the Oshawa Hawkeyes to finish the season with a 4-4 record. The Stallions advance to the playoffs where they face long adds the first place and 8-0 Brampton Bulldogs. The game is this Sunday at 3pm at Chinguacousy Park in Brampton.